Some dog owners prefer to feed their dog high-quality dog food that is earth-friendly and sustainable--on top of being delicious and healthy!. If you’re one of those dog owners, our organic dog food reviews take a look at some of the many options out there to help you choose the perfect dog food for your favorite canine. First, take a look at these features to consider when comparing different organic dog foods. Weight: Comparing the size of the products available is an easy way to compare value across different brands. Ingredients: Looking for a specific protein? We keep track of the main protein sources available for each dog food review. Grain Free: Although carbs aren’t a bad thing in dog food, some people prefer to avoid feeding grains to their dogs. Human Grade: If you want to dog food that’s as good as people food, look for human grade pet food options! Type: Wet, dry, and dehydrated/freeze-dried dog foods have different benefits depending on your needs. Food Standard: Some pet food is all-natural, but to earn the USDA Organic label, 95-100% of the ingredients must be organic. Now that you know what to look for, let’s dig into some puppy chow! Our top pick and budget pick put a spotlight on our favorite items, but there are a lot of other options that we covered as well. Let’s find some kibble that will get your canine best friend’s tale wagging! When you want your dog to eat as well as you do every day, Honest Kitchen is the way to go. Our top pick for the best organic dog food is a dehydrated, raw product with a high protein content that’s ideal for active canines. It’s all put together in an FDA-approved human grade kitchen facility from natural, sustainably sourced ingredients. The recipe options include Cage-Free Turkey, Free-Range Chicken, Range-Raised Beef, and Wild-Caught Fish. No grains, by-products, preservatives, or GMO ingredients. Vitamin and mineral supplements plus spinach, potatoes, and other fruits and vegetables provide a complete diet for your dog! You can also feed Honest Kitchen dehydrated dog food as a treat or mixed with your dog’s regular food. If you’re looking for a minimally processed dog food that’s easy to digest, Honest Kitchen has a great option that makes feeding a raw diet easier! Newman’s Own makes some tasty organic pet food that has the added benefit of going towards a good cause. Our favorite option for the best organic puppy dog food on a budget has to be their adult dog food formula. The formula is guaranteed 70% organic, which isn’t quite enough to get the USDA certified organic label, but more than enough to impress most people! Although not grain-free, this dry dog food doesn’t have wheat or corn, which are common allergens. Chicken and chicken meal provide protein, while organic barley, oats, and peas provide carbohydrates for energy. Plus, probiotic supplements help support smooth, healthy digestion. 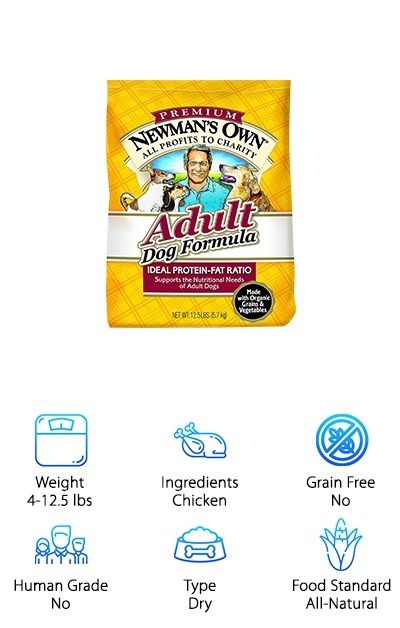 If you’re looking for an all-natural dog food that doesn’t need to be certified organic, Newman’s Own is a great option for adult dogs of every breed. All without artificial colors, flavors, or preservatives. Tasty, natural, and charitable--that’s a combination that’s hard to beat! 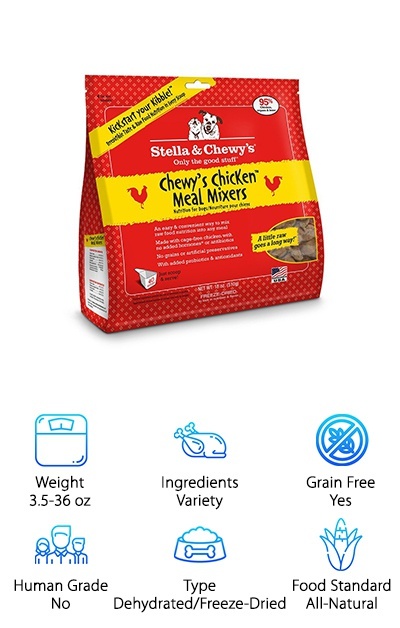 Stella & Chewy’s Meal Mixers let you incorporate a raw high-protein treat into your dog’s regular diet. All fruits and vegetables in Stella & Chewy’s products are organic, making them a great option for people looking for organic dog food brands. Choose from Chicken, Beef, Lamb, Seafood, or Turkey recipe options. The freeze-dried ingredients are responsibly and sustainably sourced. Although branded as a Meal Mixer, this freeze-dried dog food can also be used as a complete diet if you want to go totally raw and grain-free for your dog. It has all of the nutrients your pup needs for a complete diet! You can also feed it as a treat or midday snack if your dog is particularly lucky. Besides whole foods, vitamins, and minerals, this dog food contains probiotics and natural omega fatty acids to help your dog feel great inside and out! 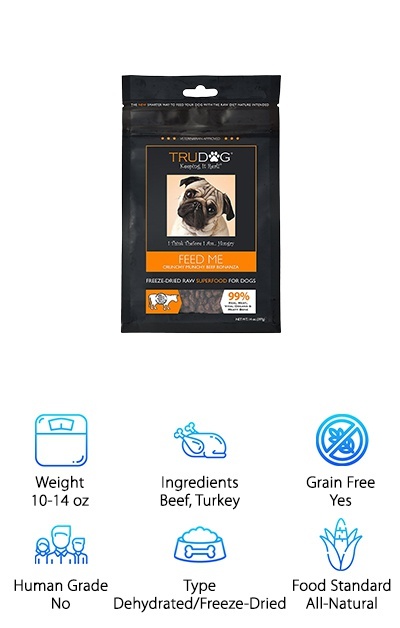 TruDog Feed Me is a freeze-dried raw dog food with all-natural ingredients from real organic meat sources. You can feed the nuggets dry as treats, or soak them for a snack or as full meals for your pup. Choose from two meaty recipes: Beef Bonanza or Turkey Gourmet Gobbler. Each recipe features the majority of its ingredients from the stated sources. It provides antioxidants and vitamins on top of a ton of high-quality protein. Dehydrated or freeze-dried products can be a great way to provide your dog with a raw, natural diet with the convenient stable shelf life of typical dry dog foods. If your dog has allergies or intolerances to common dog food ingredients like chicken, corn, or soy, a raw diet can help. It makes it easier to avoid ingredients that may be irritating your dog’s stomach and skin. This high protein diet also works well for active pups! Castor & Pollux offers several varieties of USDA-certified organic puppy food and dog food. The varieties include Adult, Puppy, Weight Management, and Adult Large Breed. 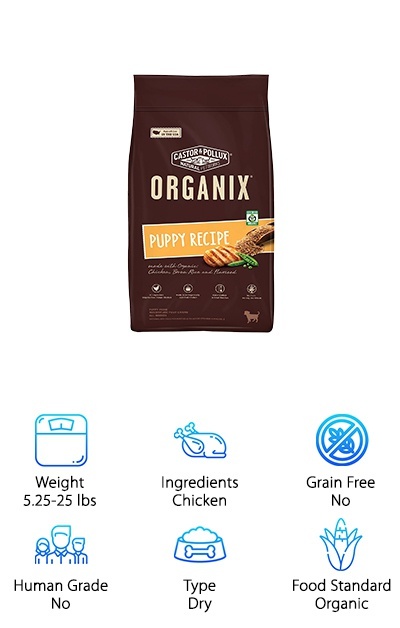 The puppy recipe is a strong contender for the best organic puppy food, starting off with organic free-range chicken. Puppy food is designed for the higher energy needs and growth of young dogs. The USDA certification means over 95% of the ingredients are organic, with no corn, wheat, soy, or animal by-product meals. It’s all put together in the USA in an organically certified kitchen, combining organic barley, peas, and other fruits and vegetables. Nutrition from vitamins, minerals, and whole-foods sources provide support for your puppy’s growing system. Probiotics support healthy digestion, and omega-3 and omega-6 fatty acids help keep their coat and skin vibrant. A crude protein content level of 26% ensures your pup can build lean, strong muscle that will serve them well when they’re all grown up. Castor & Pollux also offers a variety of wet dog food options that are all certified USDA Organic. That means that over 95% of the ingredients are organic! The recipes come in packs of 12 12.7-ounce cans, including Chicken & Brown Rice, Chicken & Potato, Turkey & Vegetable, and Turkey, Carrot, & Potato. Plus, it’s free of corn or wheat products. Instead, your pup will get energizing carbohydrates from ingredients like organic brown rice and organic potatoes. Other organic whole foods plus supplements of vitamins and minerals give your dog everything they need to be your best friend! Designed for adult dogs, you should feed .75-1.5 cans per 15 pounds of body weight per day. The pull-tab lids make the cans easy to open. This organic wet dog food is perfect for dogs with sensitivities or allergies to corn or wheat, and for owners who want to feed organic! For some people, dogs are more than just pets--they’re family! And you wouldn’t feed your family dry kibble with tons of mystery ingredients. That’s where Honest Kitchen comes in: they offer human-grade dehydrated dog food, made in a human-grade food processing facility. The all-natural recipes have no by-products, preservatives, or GMO ingredients, and plenty of organic and ethically sourced ingredients! 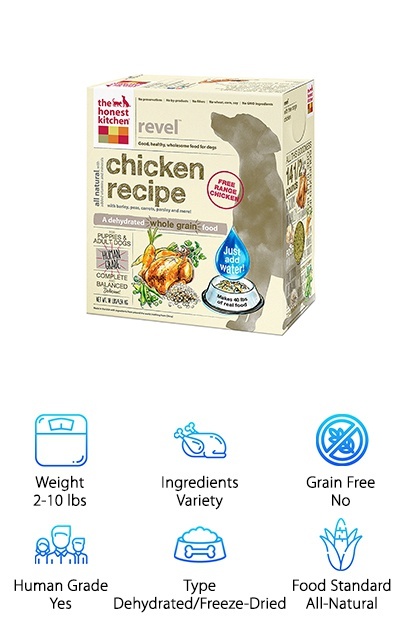 The recipe options include Cage-Free Turkey, Free Range Chicken, and Range-Raised Beef. Organic whole grains like barley, flax, and oats combined with potatoes provide healthy carbohydrates for energy. This organic food for dogs has a whole food focus that’s hard to resist! It’s a great option for people who want to feed their dogs a raw or minimally processed diet. At the same time, it’s just as convenient and easy to store as typical dry dog food. Wet food can also help a dog on a diet feel fuller on fewer calories! If you’re looking for USDA-certified organic dog food, Kirkland organic dog food has the USDA’s seal of approval--and ours, too! To get that label, at least 95% of a product’s ingredients have to be organic. 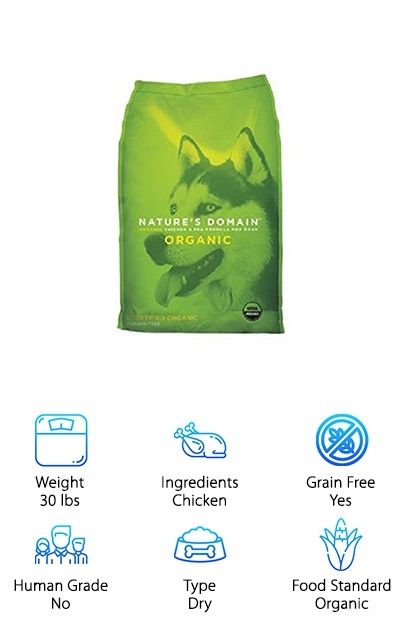 Nature’s Domain dry dog food starts off with organic ingredients like chicken, peas, lentils, garbanzo beans, and sweet potatoes--and it keeps going! Rather than corn or wheat, this grain-free dog food uses legumes, sweet potatoes, and potatoes as nutrient-rich sources of carbohydrates for energy and fiber for easy digestion. Vitamin and mineral supplements ensure your dog gets complete nutrition, too! Designed for the needs of adult dogs, it’s made in the USA and super delicious. This dry kibble contains 22% minimum crude protein as well as minimum levels of omega fatty acids for a shiny coat and flake-free skin. It’s a great choice for many adult dogs at a range of activity levels. 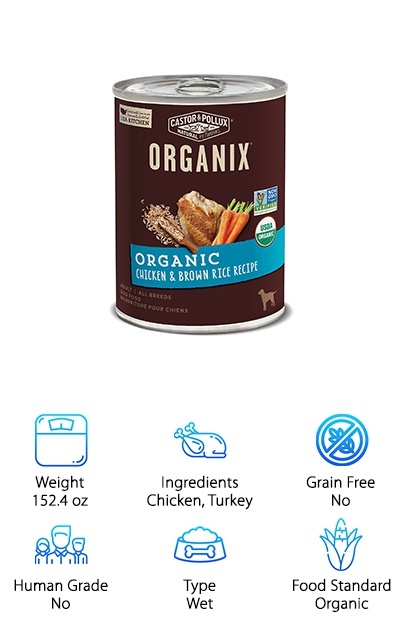 Natural Planet Organics offers some great options for organic dry dog food, including several grain-free and chicken-free recipes that we review below! If your dog doesn’t have an intolerance or allergy to grains or chicken, their Chicken & Oats formula is a great way to get their tail wagging. The organic ingredients include chicken, brown rice, oats, barley, flaxseed, and more! Suitable for all life stages and dog breeds, this dry kibble packs in a lot of nutrition on top of a delicious taste. Your pup will receive omega fatty acids, taurine, prebiotics, and probiotics to help give them everything they need for their health. Many nutrients are also sourced from organic fruits and vegetables, so your dog can get nutrition from whole food sources. 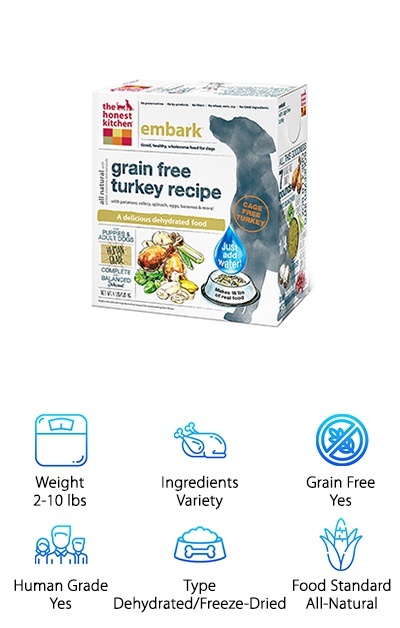 It’s a great option for avoiding corn, soy, and animal by-product meals to give your dog a healthy diet with no fillers. Natural Planet Organics offer a variety of unique protein sources and organic ingredients in their dog food recipes. Suitable for all life stages and dog breeds, this dry kibble also comes in a few different tasty flavors and packages up to 25 pounds. Organic non-GMO peas and pea flour are the main organic ingredients in their grain-free recipes. 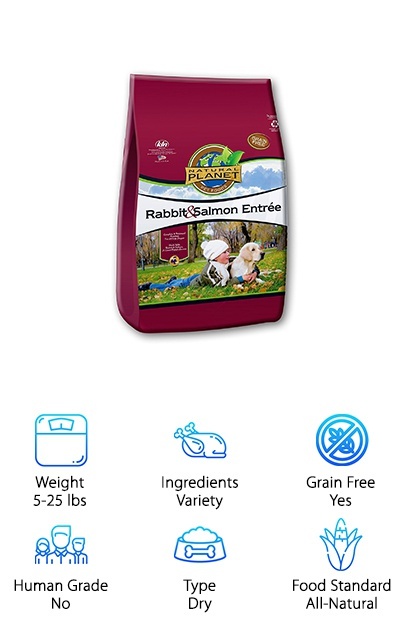 The Rabbit and Salmon Entree contains rabbit, salmon, and salmon meal as main protein sources. Other recipe options include Duck and Whitefish and Duck and Salmon. These organic dog food options include prebiotics and probiotics to help improve your dog’s digestion as well as all of the nutrients they need to stay healthy and strong! The 25% protein content provides a good balance for dogs that are active or lazy. If your dog doesn’t respond well to typical dog food protein sources like chicken and has a grain allergy or intolerance, Natural Planet Organics has some great options!